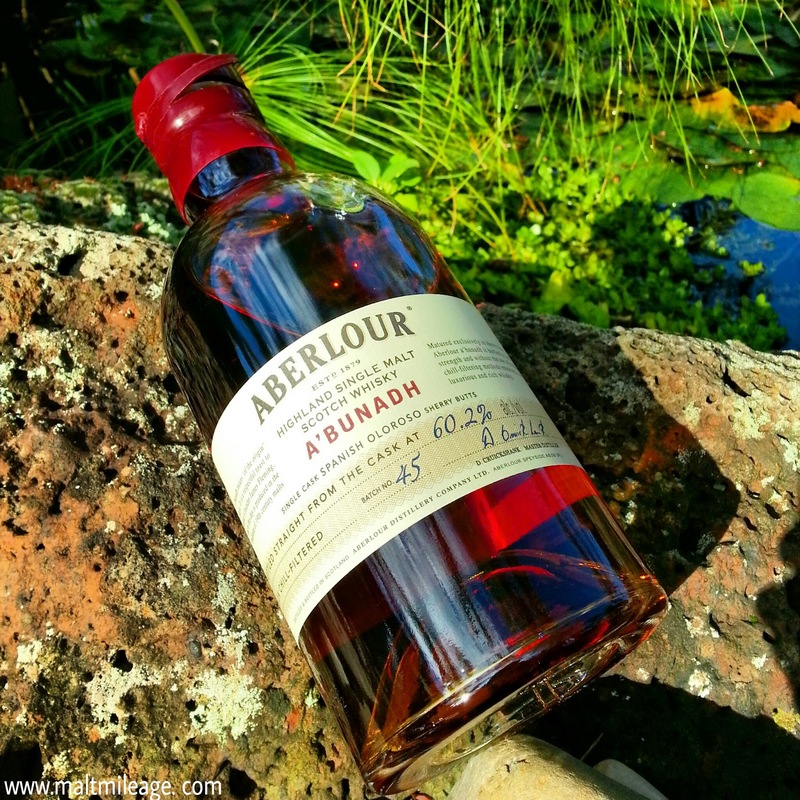 Aberlour A’Bunadh (“The Origin” in Gaelic) is a whisky that whips the senses – sight, smell and taste – with a piercing vibrancy that engulfs the palate with flames of dry sherry and spice as the burning embers leave a complex array of fruit cake and dark chocolate layered with helpings of orchard fruit and berries. With water the magic softens, as ripe red berries mingle with dark chocolate to leave a creamy chocolate milk finish that coats the tongue. Neat: Piercing dry oak and sherry cuts through dense prune and raisin packed Christmas cake layered with vanilla bean whipped cream and topped with shavings of dark chocolate, sprinkles of cocoa powder and mint leaves. The smell of freshly brewed filter coffee is in the distance, with some notes of dried cranberry. With water: The piercing oak and sherry mellows, as the pulsating diversity of orchard fruits – blood plum, ripe apricot and yellow peaches – wafts up with sprinklings of nutmeg, cinnamon and rose petals. The cocoa also softens into milk chocolate while strawberries and cream deliver a more subdued aroma of sweet sherry spilled over a bed of lush green. The sweetness develops in the glass, as the fresh very ripe strawberries develop into jam, as shimmers of sugary sweetness weave in and out of soft oak and an orange chocolate sponge cake. Neat: The dry surge of oak and sherry is met with the a crisp bite of alcohol that has been clearly distilled with utmost love and care. Dry fruit cake loaded with raisins and dried cranberries is layered with pure cocoa, orange peel and burnt toffee as energetic gusts of cinnamon and anise seed bring spiciness. With water: Soft pulses of sweet sherry and red berries – fresh strawberry, cranberry and raspberry – hit the tongue in waves. It is replaced with mild bitter dark chocolate that leaves a coating of creaminess, and a lingering milk chocolate consumed to the bottom as the chocolate powder brings bitter-dry sweetness. Neat: The dry oak and sherry is a constant theme, that on this finish develops into the bitter-dry burst of red grapefruit that leaves the palate salivating for more! On the finish is the bite of a home made tiramisu; the snap of good alcohol (hence the “home made” emphasis), the cocoa and the creamy sweet coffee laden centre. With water: The bright burst of red grapefruit and dark chocolate only develops moderately with some dry oak, as the character softens to milk chocolate with dashes of preserved strawberry and jam. I have a bottle of batch 38 open right now and it is lustful in it's sticky fruit cake elements. The cask strength nature delivers a variation from year to year and i have seen some dramatic changes. I have set a goal to try to buy a bottle every year. PS. think you just got spammed by the previous comment. Thanks for your comment. Lustful!!! Great word to describe this beauty. Looking forward to reading what you think about each batch.